When Jean Plaidy’s novel on Henrietta Maria, wife of England’s Charles I, was republished by Three Rivers Press/Crown in 2007, they chose to omit the author’s foreword. I’m posting it here for those of you who have this edition and are interested in Plaidy’s thoughts on the subject. It reads more like a personalized jacket description than her opinion on a controversial topic, as is usual when she includes an author’s note. But I do see where they found their new title. “This is the story of a tragic queen told as though by herself during what is undoubtedly the most turbulent period of English history. Henrietta Maria’s father was murdered a few months after her birth and she grew up in a court of intrigue which was constantly on the verge of conflict until the arrival of the future King of England on a romantic visit to Spain. Eventually Henrietta Maria herself was betrothed and embarked on the stormy years of a marriage which seemed doomed to failure overshadowed as it was by the malevolent Buckingham. 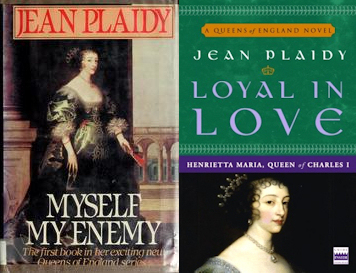 But out of these tempestuous beginnings grew one of the greatest love stories of all times and Henrietta Maria fiercely loyal in love, impetuously ruthless in hatred, stood beside her husband through his tragic progress. This is an account of a most successful yet disastrous marriage between a man of honour determined to do his duty as he saw it, and a woman entirely devoted to helping him. Blindly they blundered through the years, watching the fall of Strafford and the rise of men such as Cromwell, Hampden and Pym, unaware even of the spies in their own household; and so came the inevitable march towards ware, Englishman against Englishman, Cavalier against Roundhead, the sequel of which was played out on a cold January day in Whitehall. At the centre of the disaster stand the King with his unswerving belief in the Divine Right of Kings and his Queen, warmhearted, passionate Henrietta Maria who was her own greatest enemy and that of those whom she loved best.